by Gilbert Carpenter, Sr. & Jr. 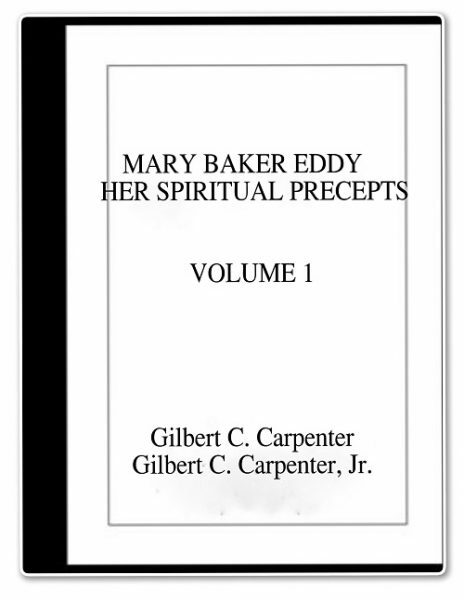 This five volume series relates to historical events concerning Mrs. Eddy and the Church from 1895 through 1903, and also Mr. Carpenter’s explanation through precept and example of the spiritual significance of these events. Precepts originated in talks that Gilbert C. Carpenter, Sr. gave each morning to small groups. His comments were dictated by the subject-matter found in Mrs. Eddy’s letters to the Board of Directors from 1895 to 1903. One by one, Mr. Carpenter read and commented on these letters, relating them to specific events and persons, and then suggesting the spiritual reason she had for writing them. Quite often a letter would lead to a discussion that answered long-standing questions about Science. These talks were recorded by Gilbert Carpenter, Jr., and edited as transcripts. In time a few copies of the first three volumes of Precepts were published for private use. The subject-matter was so sensitive, and opposition by the Directors was so threatening, that he did not distribute them as he did the other books he published. However, he made certain that copies were preserved for posterity by placing a few transcripts and books with close friends. They are important for both their historical and metaphysical content. Few of her students seemed to understand Mrs. Eddy’s teaching on animal magnetism and malicious malpractice as Mr. Carpenter did, and he shared this invaluable insight as he discussed these letters.